Youth defendants in Manti, Utah are at times shackled to a floor ring at the courthouse. Photo by Francisco Kjolseth/Salt Lake Tribune. 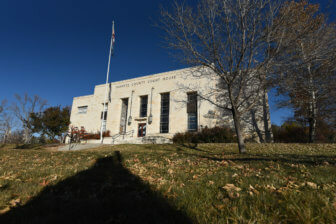 Inside the pale stone historic courthouse in Manti, Utah, a rural town of 3,500 about two hours south of Salt Lake City, youths coming to court from juvenile detention centers sit in the jury room with their hands bound to a belly chain that rests on their hips, a bailiff watching over them as they wait for their cases to be called. 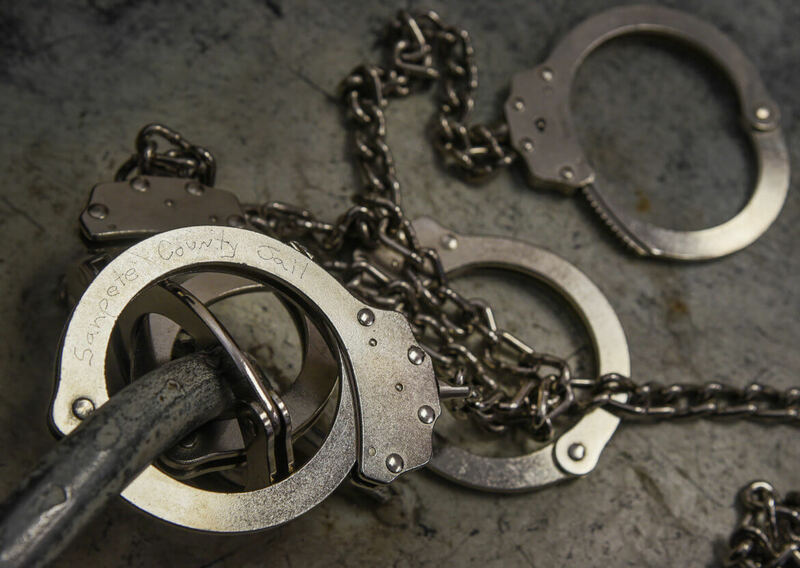 That conflicts with practice in many states, where rules governing the shackling of minors ensure that it is used only when justified for security reasons. Those rules in fact are supposed to operate in Utah as well. But there’s a price to be paid. Treating even those who commit minor offenses as hardened criminals not only produces long-term trauma but creates a stigma that is hard to overcome for youths whose unstable behavior has already brought them in contact with the law, say youth advocates. “There is something fundamentally, potentially damaging, to take a person [who has] been injured psychologically, emotionally, physically and further restrain them,” said Shawn Marsh, director of judicial studies at the University of Nevada in Reno. Marsh was part of a national group that pushed to end indiscriminate shackling nationwide. The social psychology professor said research has shown that few youths are legitimate flight risks who need to be restrained. Utah legislators appear to agree. “In my view, the evidence was compelling that shackling a youth in court was unnecessary and only had negative psychological effects of shaming and embarrassment,” Former State Sen. Aaron Osmond, a Republican who sponsored the 2015 bill to change the rules about shackling, told The Salt Lake Tribune. Before the 2015 amendment, any youth who was staying in a detention center, regardless of the severity of his or her alleged crime, came to court handcuffed. As a result, in most Utah courtrooms today, youths wear no restraints unless the juvenile court judge finds they pose a risk to public safety or a danger to themselves. Nevertheless, concerns about the impact of shackles on vulnerable youth appear to be trumped by the lack of security at the 83-year-old courthouse, an “exigent circumstance” that court officials say won’t be remedied unless a new facility is built. In Manti, there’s no holding cell in the courthouse to secure defendants before and after hearings. 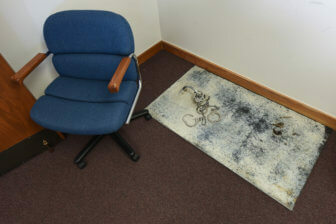 The metal floor ring welded to a heavy steel plate in the jury room was originally made to be used in the courtroom during a murder trial for an adult. Now, it’s used to hold juveniles for short periods of time. Bown said this generally only happens once every month or so, when a youth is unexpectedly taken into custody and an additional bailiff isn’t available to watch him or her. He couldn’t recall anyone being shackled to the floor in the past six months. One of the most serious affects of shackling youth, many of whom already are suffering trauma, is the loss of autonomy. Marsh of the University of Nevada, said one of the most serious effects of shackling youth, many of whom already are suffering trauma, is the loss of autonomy. Thomas said Voices for Utah Children found that youths’ experiences in Utah’s juvenile justice system can vary greatly, based on which county they live in — and not just when it comes to whether they will be handcuffed in court. She said the group found frequent discrepancies in whether a youth offender was given an attorney. Not everyone thinks shackling is by definition abusive, however. “I haven’t noticed anything that jumps out at me as abusive or excessive,” David Angerhofer, who works as a public defender in Sanpete County, he said in a recent interview. But he admits that not having a holding cell or a conference room in a secure area of the courthouse does create challenges for a defense attorney. If he needs to talk to a young client before a hearing, his only option is to sit side by side in a set of mismatched chairs with his client, just outside the jury room in a secure hallway. One problem noted by observers is that the judge and inmates use the same building entrance and exit, Roberts said. There have been times, he added, when a defendant has left the courtroom and followed a judge to his car to argue over a ruling. In recent years, court officials have asked legislators to provide funds for a new courthouse, but the project has been ranked too far down on the priority list to get state funding. They are trying again this year, requesting more than $19 million in state funds to erect a new building that will help solve their most pressing safety concerns. Jessica Miller, a staff writer for The Salt Lake Tribune, is a 2018 John Jay/Tow Juvenile Justice Reporting Fellow. This is a condensed and slightly edited version of a story written as part of her Fellowship project. The full version can be accessed here. Readers’ comments are welcome.